If you’ve ever gotten to the end of the year and realized you only finished 3/4 of your curriculum, you could probably use a pacing guide. A pacing guide is just a simple document that maps out a rough estimate of what you’ll teach each week of the year. It doesn’t mean your plans are sealed in stone – you can always feel free to change them later. But what it does do is give you a gauge throughout the year so that you know whether you’re ahead of schedule, right on track, or (gasp) behind. And if (okay, let’s be serious) when you get behind, you’ll be able to adjust to get back on track. Pacing guides takes a bit of work in the summer, but it’s well worth the time invested (and you can potentially use it again from year to year with just a few tweaks). Step 1: If you are not already familiar with the course, examine the course, textbooks, and any major projects that the course will include. Step 2: Look at your school’s calendar for the year and figure out how many days of class you will have. If you don’t want to take time to count each day, you can probably estimate around 170, but if you’re able to be more accurate that’s even better. Estimate how many classes you’ll lose to field trips, practices, half days, standardized testing, etc. Step 3: Divide the number of days by the number of chapters or major concepts you plan to teach. This will provide you with a very rough estimate of the days per chapter/concept. Step 4: Take a look at the number of planned days for each concept and determine if it’s realistic. Shorten or lengthen the number of days you plan for each concept. If you know you’re probably not going to have time to finish all the concepts in your curriculum, don’t just give up on the last one. Strategically plan which concepts are less critical and make those the ones you skip or shorten. If this is your first time mapping the course, don’t stress too much. Just make an educated guess. Next summer you can fine-tune your plan. Step 5: Set up a calendar. The simplest way to do this is to first mark off the days when you will not have class. Then, start counting out the days for each chapter. For example, if you planned 16 days for a chapter, count 16 days and write “Chapter 1 Test” on the 16th day. Continue through the rest of the year. Finally, format your plan however you like. Leave it as a calendar or make it into a list of concept end dates. Note: Feel free to plan in as much detail as you’d like. I plan which lesson I will (hypothetically) teach on each day, which ones I will spend extra time on, and which ones I will skip or shorten if needed. This helps me know exactly how many days behind or ahead I am at any point in the school year. 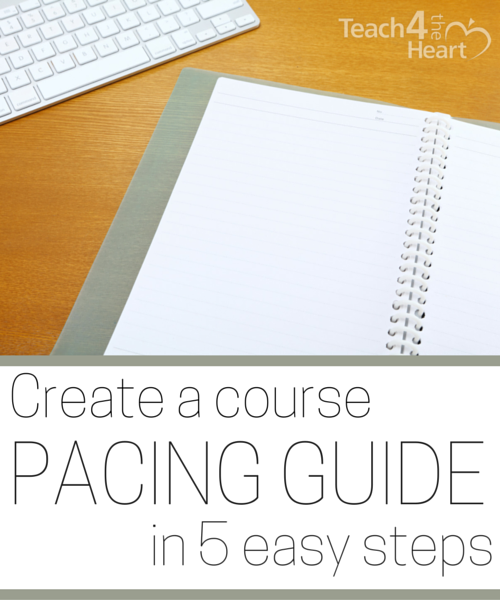 Do you use pacing guides for your classes? What tips do you have for planning out your course? Hi, Linda, thank you very much. Have a great summer vacation. I would love to be able to do this, but I’m a first year teacher with no curriculum and a list of resources I may or may not use. How can I effectively plan my year if I don’t really know what I want to teach yet and don’t know how long anything will take? It’s going to be mostly guesswork but it’s better to make an educated guess than to have no plan at all. You need to figure out now at least a tentative plan of what you would like to cover. If you start out with estimating just the first semester, you might not be as overwhelmed. Thank you so much for sharing what you know about teaching. I just bought your book. : ) I know I should have done it sooner, but it’s better late than never. This will be my second year teaching High School (Spanish 2 and International Baccalaureate ) I’m planning not to be sooo stressed out as I was lat year. Thank you again! !